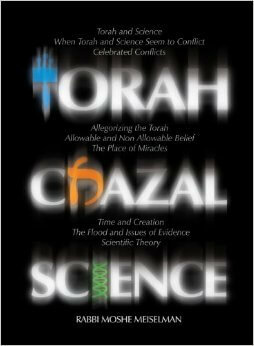 The above is my own summary of Rav Moshe Meiselman‘s 600+ page book which discusses how Judaism and science interrelate. With some skipping here and there, I’ve actually gone through the entire book to arrive at the summary. Rav Meiselman has some impressive credentials. He holds a doctorate from MIT, was a close student of Rav Joseph Soloveitchik, and is Rosh Yeshiva at Yeshivas Toras Moshe in Jerusalem. I personally hold his only other published English work, Jewish Women in Jewish Law, in very high esteem. Rav Meiselman has no problem taking others head on with whom he disagrees – this includes very direct references to the works of Rav Aryeh Kaplan, Rabbi Jonathan Saks (former chief Rabbi of the British Empire), Shlomo Sternberg (Bar Ilan professor), fundamentalist Christianity, and others. This work also includes some obvious but never-named references to Nosson Slifkin who has gone on a very public warpath, especially through his blog, against anyone who he perceives is against his own books. More on that later. Rav Meiselman’s logic is fairly straight forward. He takes as truth our tradition that Torah was handed to us from Sinai. This is a basic belief of Judaism. There are a few zeniths of knowledge – when Adam was given a human soul, at Mt. Sinai, at the time of King Shlomo (First Temple Period), and again when the moschiach [messiah] arrives. At Mt. Sinai it was greater than at the time of King Shlomo because there was direct access to the source. King Shlomo, on the other hand, was able to logically learn out just about everything from the principles of how to restore lost information. This included cures for diseases and the exact parameters of mitzvahs in the Torah. The point is: the information was there, complete, and correct. As we move further away in time from the informational zenith (but closer to another one), then not only is information lost, but even the knowledge to understand the writings of previous generations may be lost. There *might* be errors, but we believe that the Creator is actively involved in the world, and as such, is preventing any major deviations. More likely, we are misunderstanding. So what happens if science and Torah don’t fit? He divides this into two categories – 1. “extrapolative” or “historical” science and 2. confirmed tests of present reality. The first category he does not consider science at all. We might, say, have a working model to help us categorize such as is called “evolution” but, quoting his rebbe before him, science is overstepping it’s bounds when it posits any such thing as truth. At best, science reveals approximations and where these approximations don’t comport with Torah from Sinai, it is the science that is wrong. The Torah need not be “made to fit” and should not be made to fit. For this, in Rav Meiselman’s eyes is degrading to the truth by putting it in the “one down” position and is downright dangerous. Again, the book is large, but I’ll take a tough one because it appears scattered through the book, in order to make various points. First, Rav Meiselman uses it to show that there is vast scientific knowledge – the very dimensions of the Tevah [Ark] have amazing buoyant properties, copied in smaller form by shipbuilders in the 1800s. It fell out of practice because, well, steering doesn’t work so well (not a concern of Noach), but it seems to be a very maximal way of loading down a boat while it remains quite above water. Then the book later comes at the ark from a different angle – that of attacks on it since a) it’s impossible to feed that many animals and b) they won’t all fit, even with the massive size of the ark. The retort is something like this: “It’s a miracle, silly.” It doesn’t go by natural mechanisms and the laws of physics may, or probably were, very different before, during, and after the flood. These are different epochs of history with a world torn apart and put back together. More than once the book references the concluding sections of Iyov [Job] and a quote from the Talmud that Iyov would be on the same level as Avraham, Yitzchok, and Yaakov if only he didn’t think he had that right to argue with the Creator. So then what about the sediment layers in Greenland and Antarctica that show constant deposits due to the flow of water with no evidence of a flood? Well, the answer is above – we have no idea how the world was torn apart and put back together and what aspects were and weren’t changed. The retort from critiques is that “G_d would then be trying to trick us.” This book’s retort: “No, you’re tricking yourself with your own logic.” Rav Meiselman further argues against the Greenland sediment thing by saying that there are similar deposits on Mars with no evidence of water. So perhaps what we think we’re looking at in Greenland is quite different than scientists are theorizing. On this topic, the book’s bottom line is that there’s lots of knowledge even in the amount of Torah we have today, We have no reason to change based on what is nothing more than a new religion that is deciding otherwise based on their theories which are stacked one on top of the other. Rav Meiselman’s sourcing on the history of science, and what knowledge came from here is impressive even if you disagree with every one of his conclusions. Through this, the book shows quite well how theory after theory has been overturned from geo-centricity (which relativity has sort of revived) to the eternal universe to Lamarckism (the theory that the environment effects traits inherited in future generations). When I took medical level biochemistry, I had realized on my own that every prior biology class I took lied to me about current scientific knowledge on that last point. In very many places, Rav Meiselman makes the point that what was taught as “truth” in the scientific world (which sometimes was put into dogma of other religions formed during such times), has been overturned again and again. If science agrees today with something in Torah, great. If not, well – neither did plenty of other scientific theories and today’s are no different and no more believable. A geo-centered universe needed irrational “epicycles” to explain the motion of planets. Today’s theories require one to have faith in dark matter which is just as strange, according to the book. Many scientists who find this troubling are referenced and it’s quite possible that these theories will also be overturned. Another problem with modern science is that it states that all life is generated from previous life. This worked out alright when science also taught the universe has been around for an eternal period of time, but today, a beginning is taught with spontaneous generation of life. Yet, despite the blaring contradiction (do we have spontaneous generation or don’t we?) the theories are still taught as absolute truth. True, Rav Meiselman states, we have some questions on things like the flood, but we have no reason to re-evaluate or re-adjust in view of another religion (which some call ‘science’) which has far greater contradictions and leaps of faith. Even a summary of a 600+ book is long. I think the above will give a reader the gist of the Rav Meiselman’s approach, but it is not without controversy. This extends to the approach of Jewish outreach organizations, the curriculum of Jewish schools, and a debate which has been going on in the Orthodox Jewish world for quite some time. That shall be the subject of the next article on the topic. To understand all your posts I this topic, could you kindly define what you mean by Torah. is it the 5 books of moses as we have it, or all of T’nakh or what??? Good question. “Torah” in this sense refers to the entire body of knowledge received at Mt. Sinai, continuing through direct prophecy for a long time thereafter, and extrapolated using methods of doing so, also revealed at Mt. Sinai and continuing through a chain of transmission until today. There is much larger body of “oral” Torah than there is the “written” portion. The “written” portion is kind of like Cliffs notes giving the structure, and the “oral” portion is how we understand it and live it. This includes things like how to put on tefillin or how to slaughter an animal in a kosher fashion which aren’t in the written Torah, as well as legal decisions and rabbinic rulings as part of a continuous chain of both a way of life and life lived of truth and meaning. For this particular post, much of it is discussing R’Meiselman’s discussion the oral Torah, including mishnah (codified: circa. 100 CE), Gemora (circa. 400 CE), the Rambam, and the Ritva (circa. 1000 CE) and how to understand them in view of the secular knowledge of their time and ours. Thank you for your definition. 1) WRT the quote: “refers to the entire body of knowledge received at Mt. Sinai, continuing through direct prophecy for a long time thereafter”. Do you (R. MM and maybe yourself as well) believe or claim that you correctly know the contents of this body of knowledge? 2) And, since Torah includes Gemorrah, then does the statement “Torah is truth” imply that (you believe) there can be NO errors or flaws in the Gemorrah? 1) Me, no. For R’Meiselman, you’ll have to ask him. 2) I don’t know enough to answer that. See my answer to number 1.
if you don’t know the contents of the “Torah”, and you aren’t able to say what RMM says about the contents, what is the value or purpose of the statement “Torah is Truth”? I am explaining a viewpoint, in this case, that of R’Meiselman. This is an article reviewing what R’Meiselman says in the book. I see where you’re trying to catch me on a semantics argument. Having done that to people more than once in life and gotten nowhere, I think it would be more productive if you just quoited the part of the review that you want to pilpul about and ask a substantive question about it. Without appearing facetious, I do commend you for responding to me. I truly am not trying to trap you in a game of semantics or otherwise. I simply do not understand the utility of your opening statement. To my understanding, if you are unable to delineate the contents of “Torah from Sinai”, I see the statement as just plain nonsense. I am open to a change of mind. I think I understand the issue. Jacob Neusner has an excellent list of different ways the word “Torah” is used. In the quote, I’m referring to the Torah of absolute truth received at Sinai … much of it has been lost over the generations, so yes, there could be mistakes. I think R’Meiselman’s opinion on that is resorting to something being a mistake is a last resort and not to be done lightly especially when we know far less than earlier generations. He states that when Chazal state something definitively, it’s not a mistake, but when something was stated as a question (e.g. question to non-Jewish scholars about heliocentricity) it means that they were unsure. It seems that by the times of the rishonim, he’s willing to say that things could be ‘mistakes’ insomuch as explanations were based on the science of their day … but he is unwilling to say that with regard to the Gemora or previous. Again, I don’t know enough to say one way or the other, but “Torah” in this sense is synonymous with “truth”. So, to be more precise, your summary statement should not be RMM holds that “Torah is truth” but that RMM believes that “definitive statements in the Talmud are truth, while others may be speculative or in dispute”. In any case, this latter statement is also not factual based on current scientific knowledge. For example, does RMM believe that the earth is motionless (I.e. does NOT rotate on its axis) as per Pesachim 94B? or that spontaneous generation of insect life exists as per Shabbat 107b? BTW, do you personally believe that Chazal (even restricted to “definitive statements”) were infallible?? I don’t think he’d call anything in the Talmud “speculative”, no. I stand by the statement made in the intro and the explanation of it given in the article and above. The book has a large section discussing spontaneous generation. I briefly discussed it in http://patentlyjewish.com/slifkin-v-meiselman-making-sense-of-the-controversy/ under the heading “first try”. The joint Meiselman-Slifkin answer is it was asking a question as to what would be the ruling if there were, and other answers, off the top of my head, were that it doesn’t actually say there is any and this is a later interpretation by Rishonim using science of their day, or that for purposes of halacha, anything smaller than we can see doesn’t count. it’s a different definition than ‘current scientific knowledge’. It isn’t incorrect, but for purposes of halacha, it’s ‘spontaneous generation’. I also might add that ‘current scientific knowledge’ believes in spontaneous generation … both of the universe at the beginning and of life. I don’t recall the Gemora saying the earth remains motionless, but as a more general answer, we call it “sunrise” and “sunset” even though it’s the earth moving around the sun. That’s R’Meiselman’s example. There is no problem with picking any point in space as a frame of reference and discussing other things from it’s frame of reference. It’s just as correct. … and no, I never said any human being, ever, was infallible nor do I think that. Even Moshe Rabbeinu wasn’t infallible. pesachim 94b, the discussion on where the sun goes at night, makes absolutely no sense unless one assumes that they didn’t know about the earth’s rotation, which they didn’t..
as for the second Gem., you are confusing the achbar/mudmouse with lice generation, which the Gem. clearly says are spontaneously generated. R’Meiselman’s answer is that it’s true that that Chazal was unsure about this or wouldn’t have had it open to question non-Jewish scholars in the first place. He would say that it wasn’t a definitive statement and the knowledge was lost. Again, I personally don’t see what all the fuss is about. First, it’s a myth started by a Rip Van Winkle novel in the 1800s about Columbus that people thought the world wasn’t round. It’s simply not true. We have ancient Roman writings about the round earth and just watching a ship over the horizon, you can see that it appears to go down. We live our lives in a a geocentric point of view. The times for davening and the calendar in general are based on our point of view on Earth. That’s how it works and how we live our daily lives. From this point of view, the sun does go “below the firmament.” It is hugely debated what a “firmament” is in Bereshis and I don’t even know what the English word means. For lice generation … yes, I was referring to that as well. I think it’s the Noda B’Yehudah that says that anything smaller than we can see if halachically not there. We need not worry about ingesting non-kosher bacteria that we can’t see, for example. Who’s talking about flat and round??? I’m talking about the Earth rotating. The Gemorrah definitively/clearly/unambiguously held (albeit not stated literally) that both the Jewish and the non-Jewish scholars were unaware of the Earth’s rotation. because if they were, the the sun going behind the Rakia is totally meaningless, unless they held that the entire Rakia rotate with the Earth. >>>> He would say that it wasn’t a definitive statement and the knowledge was lost. So, by making this claim and calling the pericope an indefinite statement, in effect you are simply saying that whenever the Gemorrah says something that we know now to be incorrect science or history, we simply call that statement non-definitive. OK. So are Chazal fallible in science…obviously yes, just that RMM calls it indefinitive statements, instead of saying (possibly) incorrect statements. As for the lice, I’m not sure what the relevance of the Noda B. is, but the Gem. clearly states that it is permissible to kill lice because they are spontaneously generated. It doesn’t say because they are too small. I think I’ve answered all this already. no you haven’t, but if you think you have, then we obviously have nothing to discuss as we simply do not read hebrew/aramaic text the same way. Maybe contact the owner of http://slifkinchallenge.blogspot.com/ … he learns in R’Meiselman’s yeshiva and maybe he can explain it to you better. Or just buy R’Meiselman’s book as the book discusses it. Today’s theories do *not* require you to have “faith” in anything. Dark matter is not accepted on faith. Dark matter is a hypothesis (not a theory), albeit a very well-motivated and highly constrained one. Nobody claims otherwise. A rich program of experiments is directly testing it and they’re closing in fast. At the rate we’re going, I’m optimistic that we’ll either discover or exclude dark matter in the next decade or two. I don’t purport to know which of the two it will be. What I’m really sick of is people who use dark matter to distract from the completely untenable claim that the earth is not older than 6,000 years. Dark matter is completely irrelevant to the veracity of the world being much older than 6,000 years: We have ice cores, varves, radiometry, chemistry, nuclear physics, orbital mechanics, geology, stratigraphy, etc. All of these principles rely on physical phenomena that are “indifferent” to dark matter. Dark matter is so named because empirical measurements constrain it’s possible impact on “ordinary”, terrestrial matter. If, as you suggest, the earth were torn apart and put back together, if the laws of physics were categorically different in the past, then there would be no coherence across past evidence. At the very least, I would expect there to be stark discontinuities. If a person were to take principles based on what you call “confirmed tests of present reality” and go back 4,000 years, everything works out nicely: tree rings line up with ice cores, carbon dating, etc. No problem there. Then one crosses the threshold > 5774 years, and there is not even so much as a hiccup in the record. One continues to find consistency across millions of data points, relying on very different physical, chemical, and biological processes. The models still describe the past data as well as they do for the “present data”. The data continue to plod along self-consistently. It is not possible to credibly claim a paucity of evidence. The quantity and variety of data covering the last 100k years of the earth’s history is astounding. So you’re really stuck in a pickle. The term “extrapolative science” is misleading. Science is built on approaches parameter fitting and hypothesis testing, constrained by multiple independent lines of evidence. It is *not* extrapolation of isolated time series. This is an important distinction that anti-empirical, circle-the-wagons types tend to miss. Meiselman is welcome to define what he “feels” is or is not science. But, he is not the arbiter of that. Fair enough. I also should disclaim that I am not necessarily repeating his opinions fully accurately, though I am doing my best. …also, I think his point was that no believing Jew need change his beliefs due to modern science. The dark matter thing is one example. It’s not settled science, but very much still a disputed theory. Even if it were settled science, it still could change in 50 years … even if it were “constrained by multiple independent lines” (which I don’t think it is). I understand your disclaimer. I was responding to your arguments as stated, not necessarily Meiselman’s. Again, no one claims it to be settled science. But, the Age of the earth? *That’s* as settled as science gets. It is evasive to focus the discussion on the more tentative cosmological questions when, in reality, you don’t accept the far more basic science behind the age of our planet. There is a certain point where a scientific framework is so rich in data, so well studied and tested, so well understood, and so effective that saying “it could change in 50 years” lacks credibility. Dark matter could *easily* change in the next 50 years. Fine. But, the idea that we’re somehow going to discover a mistake that spans every field and discipline in science in a coherent way so as to render the age of the earth wrong by a factor of millions? That’s a stretch, to say the least. You don't think *what* is constrained by many independent lines of evidence? When did I saw I don’t hold of the science of the age of the earth? I think I do, but it’s still a lot of conjecture based on very limited data points. I simply don’t know. I wasn’t there 4 billion years ago to witness the formation of the earth or run tests and make observations. I just don’t make a claim to know any of this one way or the other. When people cite untestable theory as fact, that’s a problem. … that is what I am referring to by lacking many independent lines of evidence. I would imagine that the age of the earth, being younger, would have more lines but even so, it’s a limited number of lines. Yes, there are some limitations to our understanding of the far past (cosmology) but *not* the near past (earth’s history). The earth, being younger, doesn’t merely have “a few more” lines of evidence. It has exponentially many. And, if you zoom in on the last 100,000 years of the earth’s history there is enough data to provide a very detailed chronology, cutting across pretty much every paradigm of every field of science. Multiple lines of evidence is an understatement. You want to say that we can’t be sure the Universe is 14.5 billion years? Fine. That’s a defensible position. You want to say that we don’e have enough information with which to say the earth is older than 6,000 years? That position is simply untenable. Again … I never said the earth is not older than 6000 years. I don’t know why you keep suggesting that. Oops. I was sloppy with my language. I was using “you” synonymously with the indefinite pronoun “one”. The phrases, “if you want to tell me…” were not mean to be *you* specifically. Sorry if that came off sounding like I was putting words in your mouth. Where I am pushing back at you specifically, is your implication that there is somehow very “limited data” on the earth’s recent past and that this leaves lots of room for science to be wrong about the age of the earth. True, all human knowledge is finite and it is *possible* that everything we know in science is wrong. Nonetheless, the science is so constrained by data that a 75,000,000% error is highly improbable. We’re not talking one branch of science, we’re talking every branch of science. We’re not talking about a few lines of evidence. We’re talking many thousands. For each line of evidence there are uncountably many data points, world wide. I don’t even know how one could go about enumerating the evidence for a >6,000 year old earth. I don’t think the world is only 6000 years old nor, from my understanding, does R’Meiselman, the subject of this post. That is more of a fundamentalist Christian approach with exhibits of dinosaurs fighting humans. R’Meiselman, arguably one of the most extremely ‘to the right’ Orthodox Jewish Rabbis argues otherwise quoting Rambam on a different time clock. Perhaps, the only point where we might disagree is on exactly how accurate the information is. Science literature, especially more popular types like TV shows and some museums will state things like, “these mountains were created exactly 2.4 million years ago – older than the Rockies!” (this would be the show at the Flume Gorge in New Hampshire, though I may be remembering the claimed number wrong). To have such faith in that level of accuracy in your numbers is religion. There is so much guesswork and estimation that goes into information like that, but they present it, well, like a fundamentalist Christian. I’ll be discussing the 6 days of creation, from different points of view of modern Torah observant Jewish thinkers (Meiselman, Schroder, Slifkin, Goldfinger) in an upcoming post, but suffice to say, no one is arguing for a “literal” 6000 years … at least, not one using my or your frame of reference. First, it is important to distinguish between science literature and pop-science literature: Scientific literature (that is, published research) could not be further from your characterization. Most papers spend time discussing the limitations of their measurements and their error bars than they do on the result itself. As for pop-sci literature: there’s good and bad stuff out there. In general, it is very difficult to get the balance perfectly right. Too many caveats will distract from your main point. And, in science communication, clarity is important. This is the sort of nonsense I hear in the frum world that drives me crazy. The stated accuracy of a measurement is not based on faith. It is based on rigorous quantitative analysis, often supported by decades of prior work. Scientists don't trust their results because they "want to believe them". They trust their methods because those methods have *earned* their trust after a long and thorough vetting process. Radiometric dating methods have been around for nearly a century. They are not based on "guess work" or "estimation". They are based based on detailed systematic studies, calibrations, and repeated tests. What is the difference between the current scientific theories and truth? Is there any? It doesn’t sound like you think there are. Meiselman’s point is that science is experimentation to arrive at a result whereas Torah is the truth. If science contradicts, there are a few options: a) science is wrong (e.g. steady state universe), b) we lack in understanding of how to fit it together. Tis all. Meiselman points out that, yes, it could be that such disciplines are wrong in modern science … Why are you so certain that today’s scientific beliefs won’t be turned upside down in 500 years … or even 100 years? The ‘big bang’ has only really been accepted in the 1900s and has flaws. The steady state universe was ‘scientifically proven’ before that to the point that Einstein came up with a constant (my brother would call it a “finagle factor”) to avoid having to say it’s expanding. Such beliefs could fool Einstein! I’m not sure if this is a verbatim quote. If so, I don’t love their use of the word “exactly”. Even so, you will note that they quote only two significant figures, which I take to mean 2.4+/-0.05. I would have been upset if they said something like “2,411,221 years”, but they didn’t. An uncertainty of 0.05 million years is pretty reasonable for radiometric dating of rocks. And, I’m guessing that the error bars are small enough to allow them to distinguish the age of these mountains for the age of the Rockies (not to mention that there are probably other relative dating methods to shine light on that). So, what’s the problem? This is the sort of nonsense I hear in the frum world that drives me crazy. The stated accuracy of a measurement is not based on faith. It is based on rigorous quantitative analysis, often supported by decades of prior work. Scientists don’t trust their results because they “want to believe them”. They trust their methods because those methods have *earned* their trust after a long and thorough vetting process. Radiometric dating methods have been around for nearly a century. They are not based on “guess work” or “estimation”. They are based based on detailed systematic studies, calibrations, and repeated tests. Of course there is a difference between scientific theories and truth. I’ve been very clear about that. As human beings, we don’t have the privilege of “knowing the truth”. Human knowledge is just an *approximation* of the truth, whether we’re talking human knowledge of nature (science) or human knowledge of G-d (Torah). Meiselman’s point is that science is experimentation to arrive at a result whereas Torah is the truth. Sounds like Meiselman is comparing the sloppy reality of science against the platonic ideal of Torah. What he really should be doing is comparing the sloppy reality of science with the sloppy reality of Torah. In both cases our knowledge is finite and imperfect. In fact, I only wish that Torah were as empirically well supported as, say, the geological history of the Rocky mountains. Things would be a lot clearer if this were so. Why are you so certain that today’s scientific beliefs won’t be turned upside down in 500 years … or even 100 years? Must I repeat myself? I’ve said again and again that I am *not* certain today’s scientific findings won’t be overturned. I don’t speak in certitudes, only confidences. But, there is a *hierarchy* of confidence among scientific ideas. Some things are much better known than others. Some theories are so well-supported that waiting for them to “be overturned” is just silly. I think it very reasonable that we may have to radically rethink our understanding of the early Universe. There are too many gaps in our current knowledge. In contrast, I think it nearly impossible that we will discover that atoms don’t exist or that the earth is younger than 6,000 years. The age of the Rocky mountains? I think it could change by a few percent. I don’t think it even remotely likely that it will change by even a factor of 2. These ideas are too well tested, too well constrained, by too many independent streams of data. We only had relevant data since the 1900s. Until that point, any statements about the eternal nature of the Universe were philosophical opinions, *not* “proven facts”. There needs to be data before there can be mature science. The pre-history of a new field is defined by wild speculation and frequent overturning of ideas. Once data pours in, these sorts of 180-degree reversals become less frequent, more subtle, and more circumscribed. Judging a mature field by it’s pre-history is like comparing a 40 year with his behavior when he was a toddler. Your narrative on the history of cosmology is completely off base. I’m glad to connect you to my cosmologist friend if you want an informed perspective on the subject. Perhaps this opinion is not as well informed as you think it to be? Maybe you could point me to the Flume Gorge show you are referring to you. I’ll do a post on my blog on the various techniques they use to arrive at their 2.3 million year number. Maybe I can give you a small taste of what is actually meant by a “rigorous quantitative analysis”. Again, 0.05 million years is not an unreasonable precision for the radiometric dating techniques I’m familiar with. Excellent summary so far. Looking for the next installment. But i think you left out the treatment of allegorizing Chumash to “make it fit” and why the book shows it has no validity and is forbidden. This mythology approach to Chumash is very popular in Orthodox academic circles nowadays. I’ve been doing some searching and more reading and realize I don’t think I know enough to comment on the Slifkin / Meiselman debate. I’ve seen people attribute to Slifkin the ‘mythology approach’ to Chumush, but does Slifkin actually say that himself somewhere? Its pretty much right there in the middle of “Challenge of Creation” after he dismisses all the previous attempts at reconciliation in recent times. He quotes Nahum Sarna, Henri Frankfort and Leo Strauss and Leon Kass to support the idea that Genesis was designed as an anti-pagan myth which would best appeal to the primitive mindset of the Ancient Israelites. According to Slifkin, Bereishis is a creation myth in every sense of the word. In particular, read chapter 14 and 15. What about the view of Rav Necroponti(spelling) who I remember being a Talmid of the Chazan Ish regarding localized flood. Does he discuss how all of man came from the Dor Haglagah? It’s interesting because in multiple places throughout the book, he very much makes it clear that he’s against the concept of a localized flood. This is to the point of being somewhat close to mocking those, such as German Rabbis fighting the haskalah, for making a valiant effort but only making things worse in the long run by arguing such things. Then, near the very end of the book when he quotes his own Rav, he states that “at the very least” one must believe that the flood encompassed all or almost all of man kind. (I suspect, and this is my own thinking, that “almost all” of man kind would still fit within the wording because of the concept of “rov”.) His bottom line though is that we don’t have the information to know, and modern scientific theories have nothing on this.